This translation appeared here. The original Spanish version is here. Article 60. Every person has the right to the protection of her honor, private life, intimacy, image, confidentiality and reputation. The law will limit the use of informatics to guarantee the honor and the personal and family intimacy of its citizens and the full enjoyment of their rights. Constitution of the Bolivarian Republic of Venezuela. This story is dedicated to millions of Venezuelans of all origins and political tendencies that are enclosed in thousands of unknown computers and whose privacy has been forever violated. After several years of protests and a sturdy opposition, a signature collection was carried out to call for a Referendum to revoke the mandate of President Hugo Chavez Frias. The Referendum took place on August 2004. The “No”camp, that supported the President, created a command called “Maisanta” in honor of a gomecist general that became an anti-Gomez guerrilla, called Pedro Perez Delgado, nicknamed “Maisanta”, that happened to be the great grandfather of President Chavez Frias. It is said that the President has a supersticious predilection for his rebellious ancestor and that he thinks that Maisanta brings him luck . Wether true or not, the Maisanta Command had the objective of doing whatever was necessary to avoid that President Chavez Frias be revoked. This political crusade was baptized by the government as the “Batalla de Santa Inés”. It is within that frame that a computer search program coupled with the personal data of all Venezuelan voters, also called “Batalla de Santa Inés”, was created. The name recalls the Santa Inés Battle won by the “llanero” Ezequiel Zamora. The two caudillos, Zamora and Maisanta are also related since Maisanta was the son of a Zamora’s colonel. Moreover, both are fetish figures for the President. Thus, it is not by chance that the two characters are associated with one of the most important battles that Chavez would have to fight. 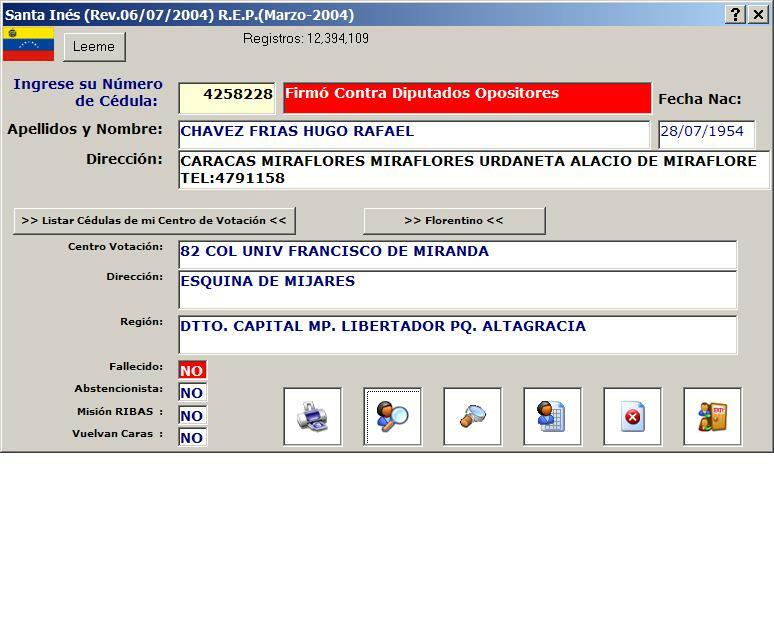 In order to create the Batalla de Santa Inés program, the database containing the information of all Venezuelan voters must have been extracted from the database of the CNE (National Electoral Council), that is the entity in charge of Venezuelan elections. If such was indeed the case, then it would be a flagrant violation of the Venezuelan Constitution that guarantees the right to privacy and that explicitly limits the use of informatics (see article 60 above). In the following months, the program was used to catalog Venezuelan citizens and, in some cases, to prevent them access to jobs and civil documents [3,4]. I was told that the program with the database could be bought freely in the streets of Caracas. There they were: Renato, Salvatore, Silvana and Rosetta, those that had been lost in a hidden place of my memory and now, thanks to this powerful program, came back to my recollection of a nine year old girl that is getting her ID card for the first time. It was a special day. We were transported by bus to the roofed yard of a large school or ID center. I think that it was located in Los Ruices or Los Dos Caminos. We were then seated on long banks, side by side, waiting for our turn. One of our school teachers, Miss Camacho, tried in vain to get us to be quiet. I wanted to seat next to Renato, but Rosetta was between us. That is why his ID number does not follow mine. Renato was in love with Rosetta and all the other girls from the Venezuelan-Italian school I attended were in love with Renato. It was not the first time that Rosetta got between Renato and me. One or two years before, I should have entered the church with Renato the day of our First Communion. But, because of my or Rosetta’s dress, it did not happen that way. I wore a white empire dress with a long bridal veil, and Renato was very handsome in a blue suit. He was holding a cream color candle, a silver rosary, a mother-of-pearl missal and white velvety gloves. Rosetta, on the other hand, was wearing an ugly cream color nun’s gown with a wood rosary attached to her waist. That was the gown proposed by the school that I had categorically refused to wear. Then, probably because of the gown, the same professor Bianchi that had always preferred me, decided to put this time Renato with Rosetta as the first couple and left me, with my magnificent bride dress made by my grandma and Salvatore, wearing his brother’s brown suit that was too tight for him, as the last couple to enter the church. That is why in my First Communion picture I am with Salvatore whereas Rosetta was with Renato. But life is really something. Even though I learned later that Rosetta and Renato had been engaged, they did not end up being together. At least, that is what was indicated by the program. Renato now lives in Colinas de la Trinidad whereas Rosetta still lives in La Carlota. Rosetta must have married a Mr. Añez because the program changes, in the American way, the second family name by the husband’s family name. I also noticed that the program must have been made by people that do not know the letter “ñ” because Añez was written with the numeral symbol, A#ez. After studying more deeply the program, I got to the conclusion that the union between Renato and Rosetta was not to be, it was impossible, at least politically speaking. They seemed to be real Capuletos and Montescos from Venezuela. In fact, the program classifies Renato as a “Patriot” and there is a red field that appears on the side of his name, the political tendency field. From what I learned “Patriots” are those that not only did not sign against the President but even signed to revoke the opposition National Assembly members. It seems that after the signature collection to revoke the Presidential mandate, there was a counter-offensive prepared by the goverment to revoke opposition deputies. Interesting, the petition did not seem to target particular deputies but to target them all at large, there are in fact “Patriots” in all the voting districts. Thus, although Renato is a Patriot, Rosetta is not. She actually signed against the President because when I access her name, a blue light appears indicating just that. I wonder when was that Renato and Rosetta started moving away from each other. The program does not explain it but it is very clear that they do not live together. On the other hand, Salvatore, my First Communion companion ,ended up being a very particular type of Patriot because despite being classified as so, there is a warning sign that pops up when I access his name. It indicates that he also signed against the President. I guess that those that wrote the program must consider that Salvatore is not politically trustworthy, that must be the reason for the pop-up. I am not sure I agree with that statement: Salvatore used to not change his mind at all when we played as kids during class breaks. Quite the opposite, he was of a stellar stubbornness. I started shuffling possibilities. Maybe Salvatore thought that the best way to finish with political instability was to sign to ask for referendums. Then, he must have signed for the first one, to revoke the President, but since he was favorable to the government, decided later to sign the second one as well. However, it is difficult for me to imagine my friend Salvatore using his civil right in such a strategic manner. Maybe he signed first but then he was forced to sign the second petition. The program created doubts in my mind, maybe, maybe, maybe. Silvana used to live somehow close to my house. But, according to the program, she moved so close that if I lived now in Venezuela, we would be voting in the same center. When I clicked the center button, I could get the list of every person voting in my center. There was not only Silvana, but also several other known names. There was Maritza, the neighbour from the corner house. I was able to learn her real age, that she had always hidden from us. Then I tried to search for Alberto, her husband, but could not find him in the center. But since his family name was quite unusual, it was easily found using the general name searching feature. To my surprise, I learned that Alberto is much younger than Maritza and that he is a “Patriot” even though Maritza signed against the President. My Capuleto theory does not hold any longer. A Patriot and a revoker living together? What type of fights would they have? Or maybe, maybe it was made on purpose so that all the eggs were not put in the same basket. After all, as they used to say, the vote was secret but the signature was not…maybe, maybe, maybe. Thus, if I had wanted it, I could have reviewed all my memories, all my friends, all my neighbours, all the members of my family. I could have learned their ID numbers, their age, their personal address, their voting center, and their political tendencies. I could have guessed their fears and presupposed their hesitations. More than fourteen million fears and hesitations! There are fourteen million people that are now everywhere and that will never be able to recover the tranquility of their anonymity. A collective and permanent violation! Then, overwhelmed by feelings of astonishment, disgust, displeasure, revulsion, I deleted the program. I tried to get back to the old idea that Rosetta was with Renato and that Maritza was indeed the age she looks. But, it did not work. It was like unlearning how to read after having read. Then I decided to fired up my computer again and started typing. And I am still here fighting, in my way, my own Battle of Santa Inés. In the story above, I have changed the names and sequence of the ID numbers of all my memories. I have also exagerated my curiosity in the search for personal details. I just wanted to demonstrate the potential for meddling in private lives that the program has created. Some of those having ID numbers close to mine happen to be old classmates, but they are not the characters of this story. However, the program is such that it could have been used to search for all my friends’ personal details, had I wanted to. In fact, and unfortunately for those of us that are listed inside, all the described features of the program are absolutely real. Marcano, C. and Barrera, A. 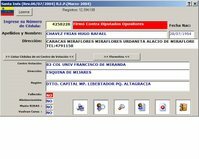 “Chávez sin Uniforme.-Una Historia Personal”. Colección Actualidad. Random House Mondadori, 2004. Venezuela News and Views blog. The English translation can be found here and the Spanish post is here. I dedicate this unimportant tale to all those that, in spite of the pitfalls, passionately used their knowledge, their means and their free time in a restless search for the truth. This is a story that many Venezuelans lived on different ways. Some with anguish, others with joy, others with stress and others with surprise, but definitively, nobody with indifference. It is the story of another one of the riddles [1,2 ] that the Venezuelans have lived during the government of Chávez. This is my story. I am truly amazed that the Venezuelans elected a caudillo, a putchist, a populist as a President. I never had to vote for him , but I would never have voted for him anyways. My idea of a country, with strong and democratic institutions, has nothing to do with the autocratic, clumsy and myopic conception that the obscure lieutenant colonel Chávez began to sell to the Venezuelans on February 4, 1992 when he accepted the defeat on TV after his failed coup d'état. I never had to pronounce myself about Chávez because I have been living abroad for many years. I never had to deal with the destruction of the institutions, with the chavista divisionism, nor with the hatreds or the daily wearing down that the Chavismo introduced in the country. I never had to watch “Alo Presidente”. Chávez was five flying hours away from my life, and although I suffered of stellar tantrums when reading the news or talking with friends, I knew that I was so far away from the Chavism that, in practice, I did not have to live it. I followed the “firmazos” (signature collection) and the trickiness and swings of the signature verifications. I prepared myself for any result in the Recall Referendum. My impression was that everything was possible and that I had to be ready for the possibility of a Chávez victory. But nothing could prepare me to which came later. My brother, who lives in California, had come with his wife and their baby for a few days of vacation with me. By pure chance, his stay coincided with the Referendum. I have two brothers. One is a lawyer that is quite funny and amusing. The other is a very serious and strict professor of statistics. Luck wanted that it was the statistician the one that accompanied me during the Referendum. I have always been amazed about the turns of life. If my brother had chosen another branch of mathematics when he decided his career, perhaps my perception of the Venezuelan situation nowadays would be different. We pleasantly spent the Referendum day. In the dining room of my house, we installed our laptops and followed the news from heroic bloggers that were posting on-line from the voting centers. We also checked the mails from our Venezuelan friends. All reported monumental waiting lines, some had taken up to 9 hours to vote. The news were good, exits polls seemed to clearly favor the opposition. Before going to bed we watched on the web a press conference of the members of the opposition alliance “Coordinadora Democrática”. They were all smiles and had difficulty containing their joy, they implied that they had won, and easily. We also saw Jorge Rodriguez, from the CNE, giving declarations. He looked tired and serious. He had the body language and the expression of somebody that has been defeated. We went to sleep but first we reminded ourselves that we should not celebrate yet because, with Chávez, one never knows. At six a.m. my husband woke us up with the incredible news that Chávez had won with exactly the opposite of the votes that were being predicted. We then read the stunning declarations given by Carrasquero, the president of the CNE, and followed all news that CNN could present. We later called some friends who confirmed the situation. They were scared because of the magnitude of what was happening. We could imagine how unclear the situation was in Caracas at that time. We began then to systematically call all those that could provide us with information and data. We wanted to know the truth. We made no less than forty international calls in a few hours. It was not an easy task. I had cancelled my local long-distance service provider account a week before and now we had to dial seven extra digits every time we made a long-distance call. My brother loudly complained about my bad timing every single time he dialed, but in the end, we were able to contact statisticians, engineers, computer scientists, mathematicians and physics friends, all those that we thought could give us information or send data to us. The idea was to collect the data to analyze how large was really the discrepancy between exits polls and the official results. Finally, my brother was sent the data of the exit polls from Súmate and Primero Justicia. The dining room of my house became then a true computing center. My brother and my sister-in-law (also a Statistics Professor), seated in front of their laptops and meticulously analyzed the data collected from the exits polls. They intensely worked whole days, for several days, despite the little baby that was crawling from the living room to the dining room and that cried sometimes to complain for being always among uncles and cousins. My husband took care of checking up news on the Internet. I made telephone calls, checked my mail and prepared fast meals, in the style of a boot camp. My children played with the baby, made errands or were asked to go fetch reference books. Because of my engineering background, I was able to understand the results that my brother and my sister-in-law were obtaining. In most of the voting centers, there was a significant discrepancy between the exit poll results and the results published by the CNE, and that, for all the states. The differences could not be explained by factors such as the selection of the voting centers. My brother and my sister-in-law, with the professional rigour that characterizes both of them, repeated each analysis meticulously several times to make sure that there were no errors. The study that shows such discrepancies, appears in the report that I include below as a reference [ 3 ]. As for me, I had heard that there was going to be an audit based on a random sampling of boxes. The word “random" always rings an alarm in my mind. Those that work with stochastic simulations, know that randomness is an ephemeral concept that many people do not quite grasp. A random number generator is simply a formula that can be programmed. The formula produces a sequence of numbers that are generated from a seed. If the seed does not change, the outcome of the program will be the same sequence. Random generators have a period after which the sequence of numbers is repeated. That is why they are usually called pseudorandom generators. A good generator is distinguished from a bad one based on the length of the period and on how predictable are the numbers being generated. It is well known that many commercial generators, like the one in Excel, are far from being random. When I knew of the audit, I tried to alert on the issues of the randomness of the ballot box numbers that were going to be generated. To whom? To whoever I thought should be alerted: I wrote mails, I made phone calls, I made posts in Venezuelan blogs. My colleagues made fun of me on that issue. How was I going to think that the Carter Center was not aware of that? I had my doubts. To my knowledge, the Carter Center’s experience was in manual elections and is led mainly by social scientists. This was a problem of mathematics and computer science. I know computer scientists that often forget about the importance of the seed when they have to generate a random number. I wanted to know what program they were going to use and how they were going to choose the seed. My worries were useless. The opposition decided not to participate in the audit, that the Center Carter and the O.A.S. carried out with only the presence of CNE personnel. During the days that followed, the scientific world related to Venezuela entered a state of effervescence. Several academics around the world began to produce studies on different aspects of the results obtained by the CNE. Many of those studies were thoroughly explained and analyzed in [ 4 ]. As for me, I mainly wanted to know how the seed of the generation in the last audit had been chosen. I wrote to the Carter Center and I received a cold but courteous answer indicating that since the opposition was not present in the audit and they considered themselves to be only observers, the seed had been chosen by the CNE. I could not believe it. The only guarantee that Venezuelans had to make sure that the audit was indeed random, fell into the hands of the very institution whose transparency was in doubt! I got infuriated with all the actors: with the opposition for not being present, with the Carter Center and the O.A.S. for letting that happen and with the CNE for accepting to have a leading role, when what was needed from them was to show their credibility. Some time later, I read in the Carter Center report that even the computer and the program used in the audit came from the CNE. Also, in an email of one of the people involved with the audit, it was explained that the CNE program had to be used because the input data was not ready in the format required to use the Carter Center’s Excel based program. Some techies on the web cried out then that as everything had been run on the CNE’s computer, there was not even the need to know the seed beforehand since a script could have simulated that the program was running and could have produced as an output a pre-established sequence. As for me, I was rather scandalized that the Carter Center could even consider using an Excel program, that is one of the worse in matters of random generation. The idea that crossed my mind then was the realization of how naïf can we be when facing well-known institutions and how, little by little, that naivety is disappearing. It reminded me of the time, when I was a little girl, when I used to think that technology was an invincible thing, created by infallible geniuses. Now that I know the limitations of people, systems, calculations and models, I ask myself, whenever I get into an airplane, how many errors were left in the design software and if the reliability experts really used a good seed when they ran the program to generate catastrophic events. I no longer have blind confidences, my motto is now "The Devil is in the details". In the days that followed, we saw with frustration and astonishment that the Center Carter and the O.A.S. accepted as finals the results of the audit and that the international community and the international press hurried, without asking any further questions, to spread the good news of the victory of Chávez. At the end of one week of intense work, we all decided to go to St.Lambert, a municipality located South of the island of Montreal. It is a yuppie area, totally away from the cosmopolitan interests of a city like Montreal. We had lunch in an pleasant terrace and we decided to forget about Chávez, statistics and random numbers. We had already lost our family vacations in contacting, alerting, studying and compiling data and we thought we could spend a single day of relaxation. We took some pictures as tourists and slowly walked from the restaurant to the main street that, by chance, was closed for the town’s summer party. It was a languid party because there were not many people around. Hardly two clowns and a kiosk with music tried to animate the few that were present and that were taking advantage of an end-of-summer sunny day. The music was not very good, but it animated a little. Suddenly we stopped in disbelief. The kiosk singer began to sing notes that we recognized immediately although the song was distorted by the incongruous Jazz type adaptation and the foreign accent of the singer. Astonished, we heard, as in a fair far far away from Venezuela and in an atmosphere also far away from cosmopolitan Montreal that the loudspeakers were screaming: "Yoooo, nací en esta rivera del Arauca vibrador..", it was the “Alma Llanera”, Venezuela’s informal national anthem. We waited for the song to finish and then we asked the singer why he had chosen that song. "Because I like it", was his simple answer. With superstition and optimism, I interpreted that as a positive sign. When I got back home, I rushed to my email to verify if there were some encouraging news. I was mistaken. In spite of the skepticism of the Venezuelan people concerning the Referendum results, the CNE never opened the ballot boxes, and the international observers never forced it to do it either. To me, that was the most suspicious fact of all. It seemed to me unprecedented that, from a human point of view, faced with the mathematical and technical lucubrations of tens of statisticians, engineers, physicists and computer scientists, the CNE directors did not take advantage of the opportunity to open the boxes and shut us all up. If I had been in the board of the CNE, I would have relished opening every single box and show every single vote to the army of nerds whose sophisticated models were showing discrepancies in the results. Frankly, I am still astonished that the directors of the CNE refused themselves such a satisfaction. And, from the institutional point of view, not opening the boxes was the most dangerous gesture for democracy: a democratic institution in charge of the elections of a country must, before anything, provide the population with the certainty that the system works and that is right and transparent. By refusing to go beyond the audit in spite of the strong doubts that weighed on the results, the CNE sealed forever the box that contains the solution of the August enigma and condemned the Venezuelan people to a perpetual doubt on the validity of their democracy and their electoral system. Everything was not negative. The experience made me appreciate the efficiency and the dedication of Venezuelans of great talent who put their knowledge, their reputation, their abilities and their time in the passionate search for an answer to the enigma of August. So this is how, after a year of analysis, readings and memories, I have decided to embody my memory in this true story that ends with the Alma Llanera. Unfortunately for democracy in Venezuela, it is a story that, for the time being, has just become an unimportant tale. S. La Fuente and A. Mesa. “El acertijo de Abril.- Relato periodístico de la breve caida de Hugo Chávez”. R. Prado and B.Sansò, “The 2004 Presidential Recall Discrepancias Between Exit Polls and Oficial Results”. Technical report, AMS-2004-6.